A perennial question asked of songwriters is “Which comes first, the music or the words?” Here with the Parlando Project, the words often were written centuries before the music; but with the pieces where I write both the words and music, the method is for the music to come first with the words. By that I mean, I tend to compose the words first, but the words emerge for me as melodies do, as a series of sounds that may precede any idea of their meaning. And even when I sit down to write “about” something, the improvisation of their melody can lead me to change what I am writing, even in the end, change what I believe I think about something. So where do melodies come from, whether they are melodies played on a string or melodies played on words? The answer, after millennia of human thought and knowledge gathering, is “We don’t know.” That area of knowing that it is, but not knowing why, is the genesis of myth. The classical Greeks and their Roman inheritors ascribed these creative incidents to “the muses”—nine goddesses that could engender music or poetry in humans. Their stories told of the bad ends that would come to those who would mock the muses by claiming they could practice the arts without them. This sort of thing gradually fell out of favor. Shakespeare in his 38th sonnet claims his beloved is as good or better a muse as one of the nine classical muses, and by the 19th century his humanistic idea that another human could serve as a muse to an artist became the common myth. No, you didn’t count wrong. I think the 10th dancer is Apollo, wearing the knee-length number. So, what use then is this old myth, the idea of an inexplicable outside source that informs artistic expression? Here’s one use I’m attracted to: it lets the artist relax a little bit about their efforts. Ever try to be inspired? That rarely works. Even the inspiration tricks that worked once, twice or twenty times may wear out and bring nothing. Have you ever been impelled with an idea, shape, thought, or melody when it’s inconvenient and unexpected? Ever beat yourself up when the ideas and expression just won’t come? Using the myth, the metaphor, of the muses you can get a handle on these things. This does not mean you don’t work at art. This doesn’t mean that discipline isn’t a valuable artistic trait. This doesn’t mean you sit on the mountain top and dawdle. Worshiping and honoring the muses just means if you sit on the mountaintop and nothing comes up, you might try the valley next time, but that “nothing” is not your fault. If you look for inspiration 365 days a year and it only comes around a dozen times, that’s a dozen more times than it would come if you never looked. If you look for inspiration only a dozen times a year, it will take 30 years to do what you could have done in one. That is a long introduction to today’s piece “To John Renbourn, Dying Alone.” John Renbourn was very good British guitarist and singer. Beginning in the 1960s, and with a small and wondrous circle of his contemporaries, he was fearlessly eclectic: blues, jazz, traditional British Isles folk music, American Appalachian ballads, 19th century broadsides, Asian music, modern singer-songwriters, or Renaissance tunes—all that could show up at a John Renbourn concert, or on one of his recordings. John Renbourn. The picture is silent because he could be playing anything on that guitar. Two years ago this month, he didn’t show up to demonstrate once again his amalgamation of music at a scheduled date in a Scottish club. He was not mocking the muses—it was soon found that he had died alone in his modest home. The day I heard the news, I hoped his suffering had been brief, or if not brief, useful. I thought of him like Frost’s solitary man in “An Old Man’s Winter’s Night,” or my father imagined in “A Rustle of Feathers,” or my own dear friend John who had died alone at home a few years earlier. I thought of John Renbourn and wished to apply this myth, this lie, of the muses to this man. 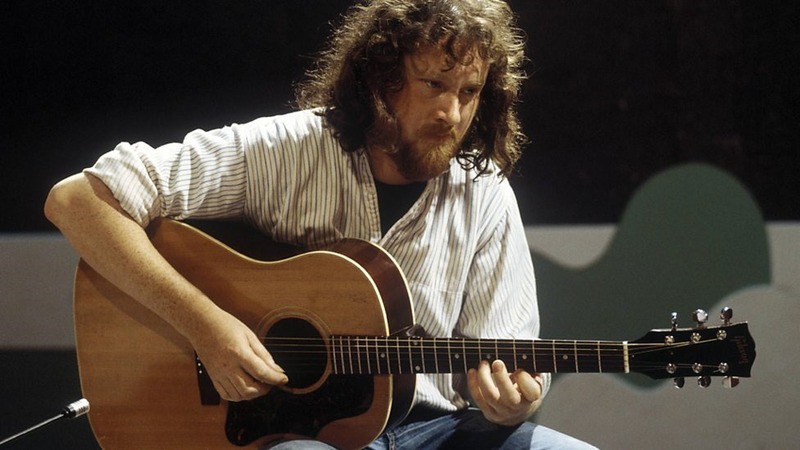 An artist like John Renbourn, who informed us with his art, listened better to the muses than most any of us. You can listen to my audio piece “To John Renbourn, Dying Alone” by using the player below.